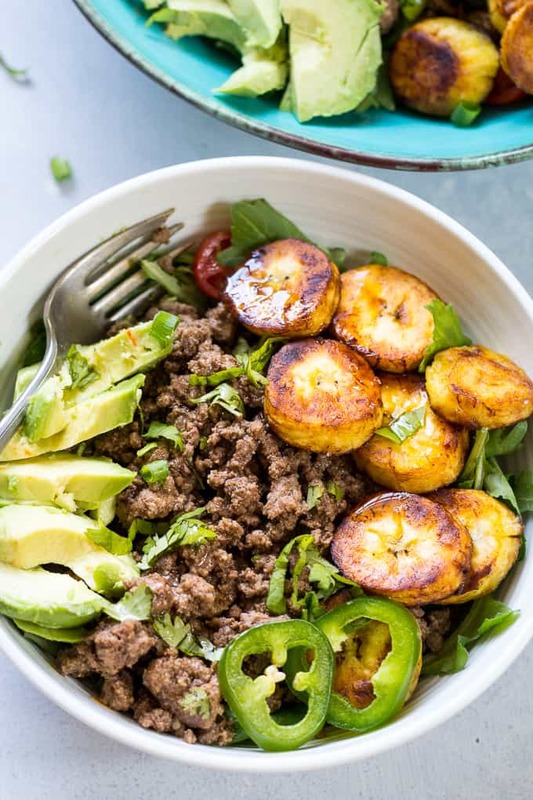 Easy 5 minute Paleo taco meat that’s perfect for quick taco salads, bowls, or wraps. 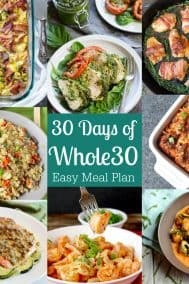 Whole30 friendly and great for busy families! This is one of those recipes that completely came to life by accident. But really, what type of “accident” results in the most delicious Paleo taco meat that you can make in 5 minutes? Hmm, well if you’re a mom like me, with VERY minimal time to spend making weeknight dinners due to seemingly endless after school activities, you might have an idea about what I’m saying. Up until recently, Tuesdays were sort of ridiculous. Emily had gymnastics from 4:30-6, Diana dance from 5-7, and Drew hip hop from 4-4:45. So, I would come home with Drew between 5:00 and 5:30 and make dinner then, usually wearing my winter jacket and barely stopping to breathe. On one particular Tuesday, I “gave up” and literally threw a bunch of meat in a pan with what seemed like way too many spices and stirred, checking emails at the same time. I think I was frying some plantains too, but, really I can’t remember. I turned off the stove and checked to make sure the oven was off (I get so paranoid when I rush like this) and Drew and I left to get Emily. That night to my surprise, dinner was pretty flipping awesome. Everyone loved it (we did make your own tacos – YAY for taco Tuesday) and I had leftover taco meat for lunch the next day. Since then, this 5 minute taco meat has become my go-to “I’m-in-a-damn-rush-and-can’t-be-bothered” dinner staple. It’s an all-purpose, EASY taco meat that can be used in any meal (perfect to make ahead or for leftovers), with all your favorite toppings! One note on the meat I use. I’ve made this with many different meat combinations, and, BY FAR it turns out the best with beef (not too lean) and either pork or lamb. I think a fattier meat just winds up holding onto the flavors that much better. That said, I’ve also cooked this with a combo of ground beef and turkey and that was good too – I just made sure to use extra cooking fat to make up for the leanness of the meat. Ready to cook? Let’s go! Easy 5 minute Whole30 Paleo taco meat with two types of ground meat and simple spices. Perfect for quick salads and bowls when you need dinner ready ASAP! Heat a very large skillet (my 15" cast iron one is perfect for this!) over med heat and add the cooking fat. While the skillet preheats, combine the salt and spices in a small bowl. 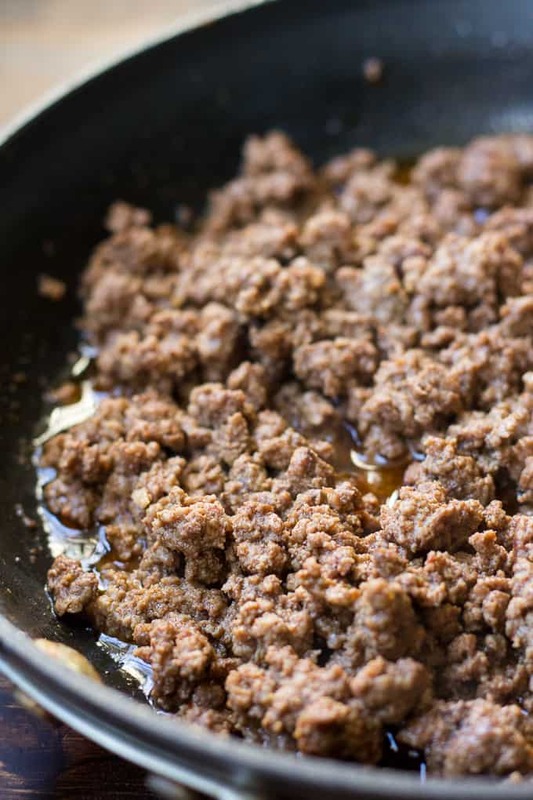 Crumble all the ground meat into the hot skillet and break up lumps with a spoon, sprinkle all over with the spice mixture and water and cook, stirring to evenly brown, about 2-3 minutes until no longer pink. Garnish with fresh cilantro and chives. 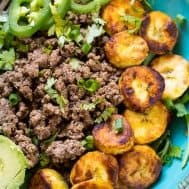 Toppings I love - fried sweet plantains or tostones, ranch dressing, chipotle ranch or avocado ranch, diced avocado and tomatoes, jalapeños, and any of your favorite veggies, pre-prepared. 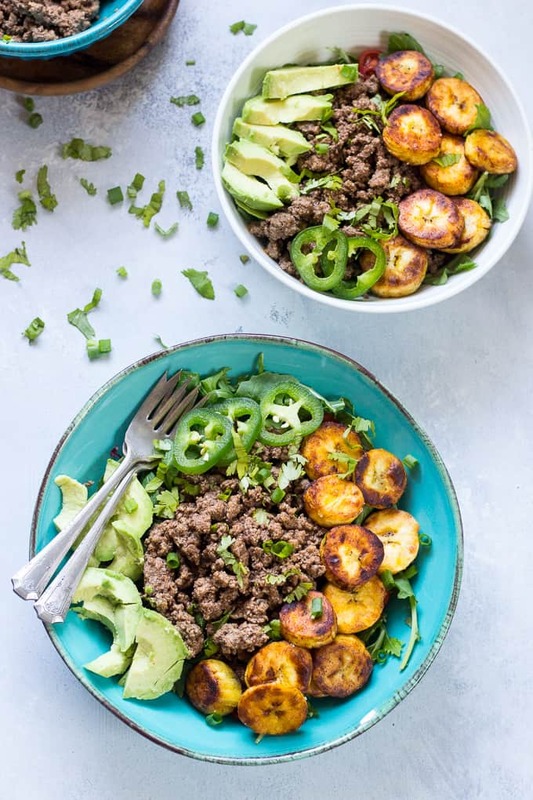 Easiest #paleo and #whole30 taco meat ever that’s ready in just 5 minutes! 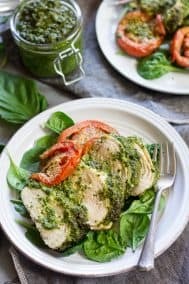 Want more quick and easy Paleo and Whole30 dinner recipes? Try one of these! Do you do Taco Tuesdays? What’s your ultimate taco salad/bowl? I made a very similar recipe in the crock pot last Saturday and it was so good! Even better reheated the next day. I ended up using what was left to make a breakfast casserole with eggs and veggies. So easy and delicious! YUMMY! 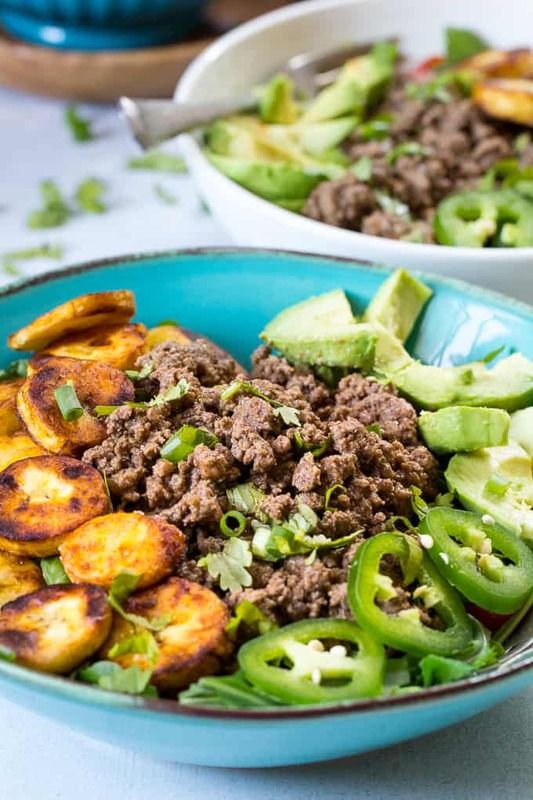 We love taco meat in our house, and I usually make a paleo version every week! Also, I wanted to say, ‘Thank you,’ for the sweet potato muffin recipe. My family loved them so much. They were amazing! I’ve done this with turkey and it’s delicious! I haven’t made plantains in forever. Can you believe that? I’m not sure why, but now I definitely need them! 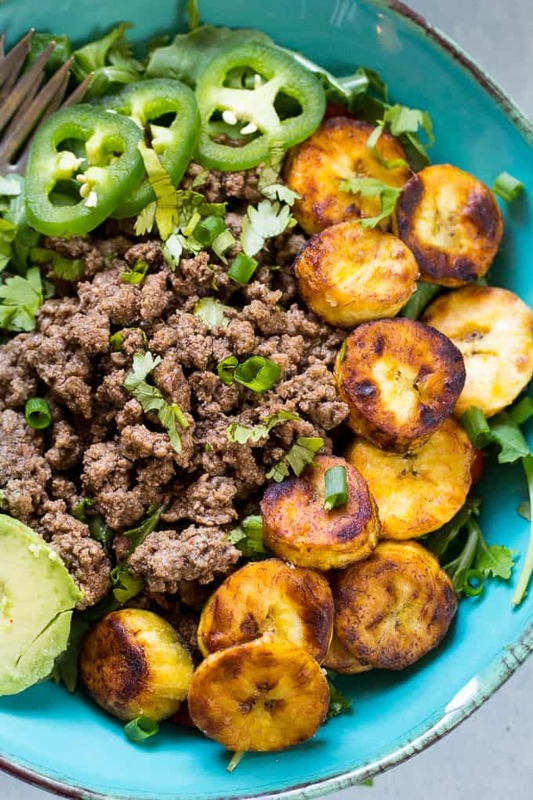 Love the idea of adding plantains on the side – I’ve never tried making those at home before!